Annual tilt will provide plenty of entertainment live and online tonight. The Cretin-Derham Hall Raiders will travel to the St. Louis Park Rec Center to face off in a non conference game featured on MyFoxHockey.com tonight. Game time is 7pm as the two teams renew acquaintances. . The #5 Red Knights have gotten off to a red hot start with a 3-0-1 record. The Raiders have flown under the radar in the early going yet have been perfect with a 4-0-0 start. The Red Knights will be paced by senior goaltender Jacob Meyers who was superb in their 2-2 tie with #4 HIll Murray last Tuesday. To date, Meyers is 3-0-1 with a 1.68 goals against average and a .930 save percentage. MyFoxHockey.com has watched as Meyers career has blossomed before its eyes and his senior season is proving to be what all have anticipated. His counterpart will be junior Joe Schneider who is perfect at 4-0-0 with a .911 save percentage. The Raiders have wins over unranked teams to date and the Red Knights will prove to be the biggest test for Schneider and his Raiders. They have defeated Blake (2-0), Stillwater (4-1), Moundsview (5-4), and Park of Cottage Grove 3-2. Leading the way offensively for Jim O'Neill's squad is junior Bob Kinne (5g-5a-10pts), senior Jesse Perron (3g-7a-10pts), and junior Tony Barbato (5g-4a-9pts). All three are veterans who have been a part of the team the last two or three seasons. Expect to hear from junior Anthony Tillman senior Riley Dombek. 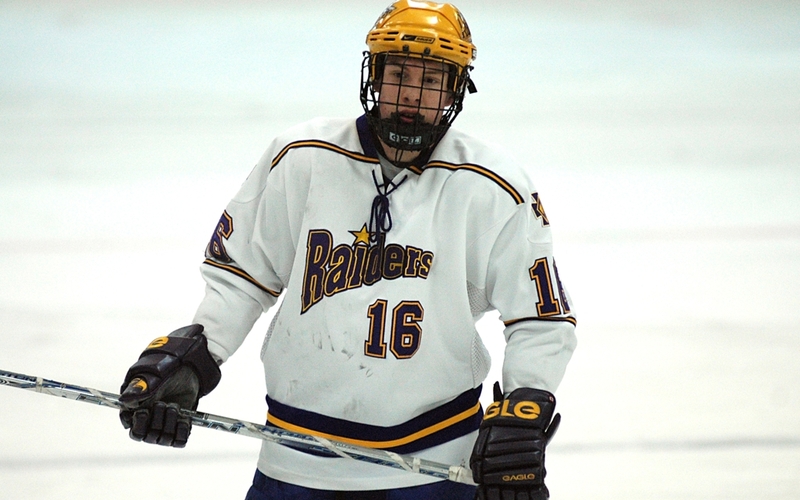 The Raiders have one of the steadiest defenseman in the game in University of Minnesota bound Mark Alt. After being injured during the Fall High School Elite League Alt, who is a quarterback, guided his team to the Class 5A State football championship. He appeared in the first two games of the season with Blake and Stillwater yet did not play in the Park of Cottage Grove contest last week. He is a slick puck moving defenseman, a quarterback if you will who also defends well in his own zone. He and the Raiders will be busy as they will have to fend off the balanced attack of the Red Knights who are led by one of the hottest lines in the state that features senior Brett Patterson (3g-7a-10pts), sophomore Christian Horn (4g-2a-6pts), and super frosh Grant Besse (6g-1a-7pts). The Red Knights are led in scarring by senior defenseman Patrick Daly (1g-9a10pts). They have seven players that have collected a point per game to date adding credence to their depth. Over the past four seasons the teams have split with the Red Knights capturing the past two games by scores of 4-1 last season and 3-2 in 2007-2008. The Raiders won a pair of one goal games by scores of 4-3 and 3-2 prior to that. Be sure to log on tonight to MyFoxHockey.com for complete coverage of tonights game at 7pm from the Rec Centre in St. Louis Park.